The American Constitution Society is pleased to announce the Twelfth Annual Richard D. Cudahy Writing Competition on Regulatory and Administrative Law. 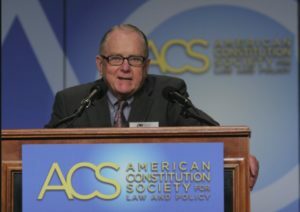 Judge Cudahy’s distinguished contributions to the fields of regulatory and administrative law combined a keen grasp of legal doctrine, deep insight into the institutional forces that determine how doctrine is implemented, and an appreciation of the public impact of doctrinal and institutional choices, including the consequences for fundamental values such as fairness, participation, and transparency. This competition seeks to encourage and reward these qualities in the scholarship of others. Judge Cudahy passed away on September 22, 2015, at the age of 89 at his home in Winnetka, Illinois, leaving a legacy as one of the nation’s finest appellate judges. Before joining the bench, Judge Cudahy was a graduate of West Point and Yale Law School, served as an air force officer, worked as a private attorney, a law professor, the CEO of a large corporation, and was a member of the Wisconsin Public Service Commission. Judge Cudahy was appointed to the United States Court of Appeals for the Seventh Circuit by President Carter in 1979, where he earned a national reputation for the depth, rigor and fair-mindedness of his opinions, academic publications and speeches. Among those who worked with and appeared before him, Judge Cudahy was known for his unfailing decency and generosity of spirit. A tribute to Judge Cudahy by his former law clerk, Judge J. Paul Oetken of the U.S. District Court for the Southern District of New York, can be found here. Award: The author of the winning paper in each category (lawyer and law student) will receive a cash prize of $1,500. The winning papers will receive special recognition at the 2019 ACS National Convention, on the ACS website, and potentially through other means agreed upon by the authors and ACS. For example, ACS’s two journals, the Harvard Law and Policy Review (HLPR) and Advance, will consider publication of appropriate pieces that meet their word limit guidelines (under 10,000 words for HLPR and under 5,000 words for Advance). Additional Questions: Please email cudahy@acslaw.org. ACS thanks the Cudahy family and his clerks for their generous support of the Richard D. Cudahy Writing Competition on Regulatory and Administrative Law. Deadline: The submission period for the 2019 Richard D. Cudahy Writing Competition on Regulatory and Administrative Law is now open. All submissions must be submitted to Cudahy@acslaw.org by Sunday February 3, 2019. Eligibility: The competition is open to all lawyers and law students. Practicing lawyers, policymakers, academics, and law students all are encouraged to participate. Coauthored submissions are eligible and if selected, the coauthors will share the prize. Submissions must be original academic works that are either unpublished or published no more than one year prior to the competition deadline (specifically, not before January 2018). If a submission has been published or accepted for publication, the author should include written consent from the journal to make sure it will consent to ACS posting the publication on its website, with appropriate attribution. Content: Submissions should be related to American regulatory or administrative law, broadly construed. Appropriate subjects include empirical or comparative analyses of the effectiveness of specific regulatory regimes or deregulation; doctrinal investigations of the development of administrative law rules or principles by courts and administrative agencies and the effects of that development; and normative analyses of how particular regulatory or administrative regimes or deregulation advance or fail to advance values of fairness, participation, and transparency. Format: A wide range of formats are eligible and encouraged, from traditional full-length law review articles to less academic, lightly-cited essays written to be accessible to a wide audience. Entries submitted must be in Word format and any citations in submissions should appear in footnotes, not endnotes. Submissions should be less than 25,000 words, not including footnotes. Shorter submissions are strongly encouraged. Judging Process: All submissions will go through an initial screening process. Finalists from that process will be reviewed by the panel of judges. Submissions will be judged on their depth of analysis, quality of writing, readiness for publication, originality (in topic selection and treatment), and thoroughness of research. The winners will be announced at the 2019 ACS National Convention.